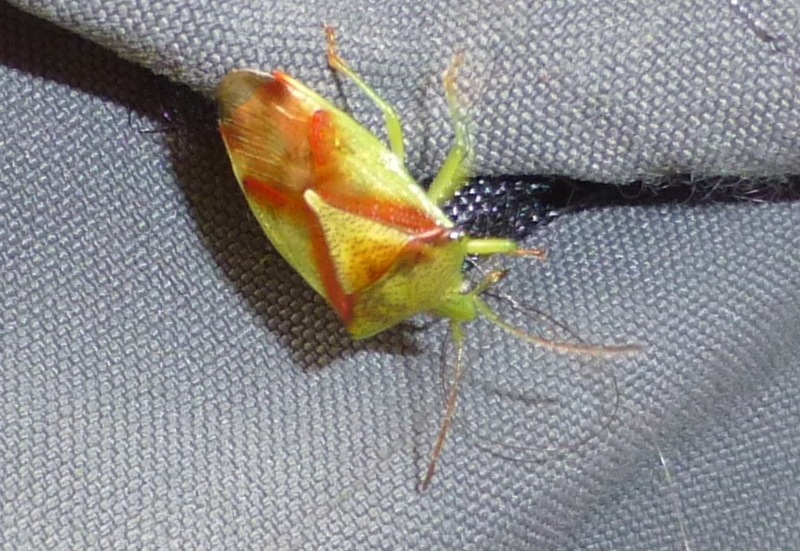 This shield bug is light green to yellow-green with reddish markings that more or less form an X across its back. It reaches 1 cm in length. Click here for more photos. The red cross shield bug can be found on alder trees across much of North America. Some stink bugs have similar colouring, but lack the distictive X of the red cross shield bug. Banasa dimidiata has a definite colour divide on its pronotum between the green top (close to the head) and reddish-brown bottom (close to the wings). Species Elasmostethus cruciatus - Red-Cross Shield Bug. BugGuide. Iowa State University Entymology. Accessed 24/11/2014.